The main material for garments making is fabric. In addition to fabric, there are lots of auxiliary material used in garments manufacturing, these materials are called trims and accessories. 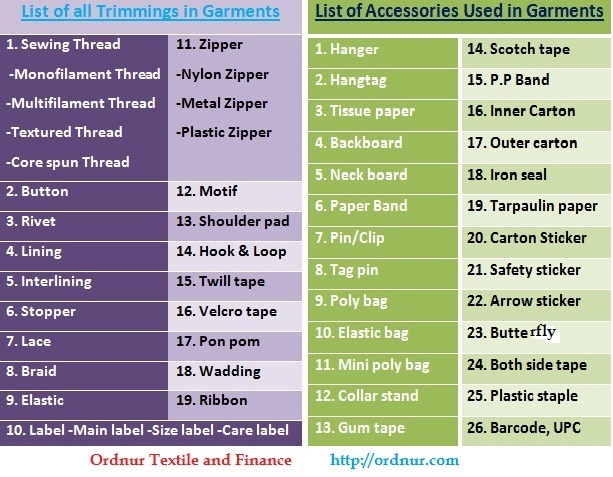 For your better understanding, I made a list of trims and accessories use in garments. Trims are used to complete a garment, whereas accessories are used to decorate garments. Trims attached with fabric by sewing, whereas accessories make cloth more attractive. Tagged Accessories used in Garments, List of Accessories Used in Garments, List of all trimmings in Garments, List of Trimmings and Accessories use in Garments, List of Trimmings used in Garments, List of Trims and Accessories Use in Garments, trim and accessories, Trimmings and Accessories used in Garments, Trimmings used in Garments, What are the Trimmings and Accessories used in Garments.